NOTE: If you're Ashkenazi and avoiding soy during Passover, substitute sauteed mushrooms for the Pinot Noir Mushroom Sauce. Combine all ingredients except the steaks in a 1-gallon Ziplock bag. Zip the bag shut and shake to combine marinade. When ingredients are well integrated, add steaks. Zip the bag shut and shake until steaks are well coated. Place Ziplock bag with steaks into the refrigerator. Let marinate for at least 20 minutes. Position oven rack so that steaks will be two inches from broiler element. Preheat Broiler on high. Remove steaks from the refrigerator and place on broiler pan. Brush top of steaks with excess marinade. Put steaks in preheated oven on top rack. Broil steaks for approximately 2 to 3 minutes per side for medium rare. When done, remove from the oven and let rest for 3 to 5 minutes. Slice and serve over potatoes. 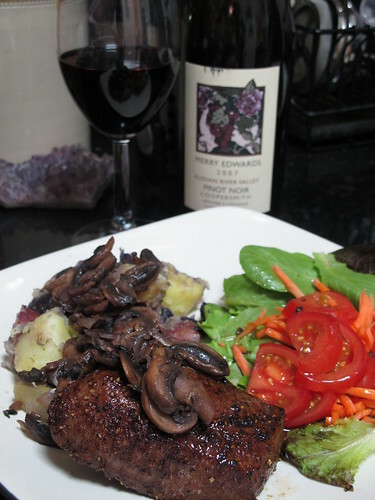 Top with Pinor Noir Mushroom Sauce (recipe below). Sauté shallot until limp, approximately 1 minute. Add mushroom and thyme and sauté until mushrooms just begin to get soft, approximately 2 minutes. Add wine and broth and simmer on high heat until liquid reduces by half, at least 6 to 7 minutes.